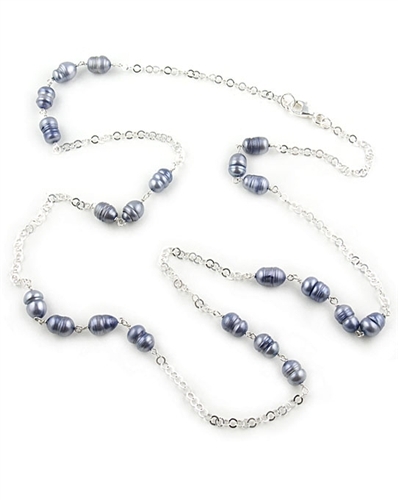 Sterling silver pearl necklace by Paula Rosellini. This elegant designer necklace features twenty one 12-13mm Indigo (silver-blue) baroque freshwater pearls on an Italian sterling silver chain. Necklace measures 92 cm (36.3") and fastens with a sterling silver clasp. A modern - classic designer necklace, easy to wear from day to night. Necklace can be worn as a long strand or doubled. Available exclusively in the UK from the Farfallina Online Jewellery Boutique.